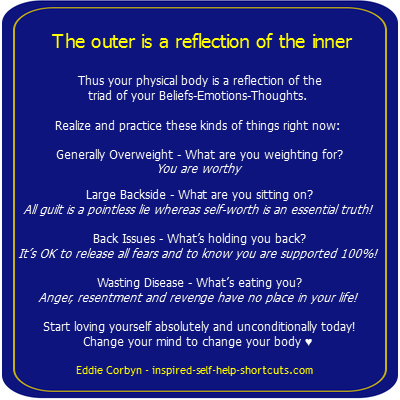 Advanced Self Help Health Advice For Using Parallel Realites! Of Parallel Realities - Part 2 Health And Well-Being! On this advanced self help health page we’ll continue exploring ways to change our experience of reality by looking into how understanding parallel realities can assist you to create a greater experience of health and well-being. If you haven't already done so, I suggest reading through the inspired self help techniques page before continuing, as it outlines and introduces the basics of parallel realities - part 1 time and space. Please understand that the idea of perfect well-being may not be what every being came here to experience all of the time. From the perspective of their soul’s theme of exploration, their physical reality blueprint, they may desire to experience a particular dis-ease as that might represent a challenge that will help them grow the fastest in this life experience. So in that sense this advanced self help health page is not about telling anyone that they "must" or they "need" to be a certain way, it’s about you deciding what’s best for you! Via the information disseminated on this advanced self help health page I’m simply here to remind you not to choose to buy into any negative or self-disempowering belief systems unless you want to and to use your personal power to best serve you. Through the examples I’ll provide you'll see that understanding what parallel realities really are and how best to move between them helps you to achieve optimum health and a true state of well-being. Advanced Self Help Health – To Believe or Not To Believe? Now, let’s say that your brother comes home complaining about the common cold he’s caught, and he proceeds to speculate about where and how he caught it and perhaps he moans about his pain. And due to the lifelong beliefs you hold you allow for the possibility that you too can catch the cold from your brother, so you think about it and act as if you probably will catch it - and so you probably will catch it. Understand that every version of reality you see reflected in the universal mirror of your life experience starts as an idea or thought in your mind. That is to say, you believe science when it says "there is such a thing as a cold that’s out there" and you believe your parents who say "be careful or you’ll catch his cold." Thus, with these beliefs firmly in place you start thinking about and behaving accordingly, thereby planting the seed of "I bet I’ll catch his cold." Understand that these lifelong beliefs that you’ve carried with you for many years are playing out in this particular Now moment. Because, you see, as you believe and so it is for you. And thus, more often than not you do indeed catch your brother’s cold, and in so doing you have thereby reinforced and completed the cycle of your belief. This advanced self help health image reminds us that reality is tied to belief! However, in terms of what mechanically took place what happened is that you shifted from a version of reality in which you didn’t have a cold to a version of reality in which you do have a cold. 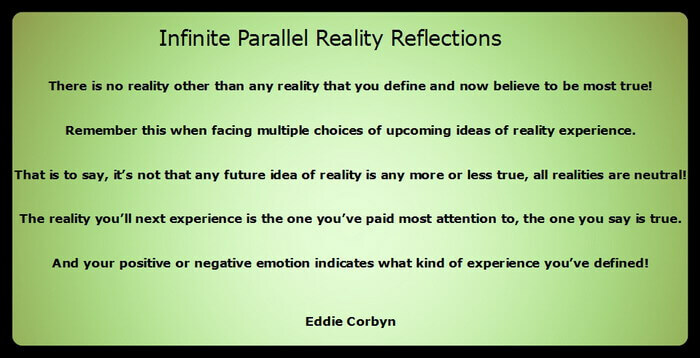 Both of these parallel realities exist Here and Now, but these two versions of reality are in no way related to each other, each is a stand-alone discrete parallel reality universe unto itself and you get to choose which one you now want to experience through your belief in it. I’ve enjoyed around 11 years of being totally dis-ease free. The last time I was sick from anything at all was around July 2008 when I had a so-called common cold. Please remember, as discussed previously, everything takes place within your own consciousness. There’s nothing outside of your consciousness so there isn’t anything "outside" of the particular reality you’re experiencing right now in this moment that can jump into it, so to speak. But if you continue to believe in outdated and outmoded myths, superstitions and old wives tales, and you persist in creating a story called "I can catch a cold from outside," then the universe has to oblige your request and it will make it seem to you as though it happened that way. Now, let’s say that one day you looked in the mirror and noticed a grey hair. And during the course of the next days or weeks you started seeing more grey hairs. So then, "because you believe" that grey hair is a symptom of ageing you began to expect more grey hairs. That is to say you’ve chosen to buy into the idea that in the future, which is a parallel reality that co-exists right now, your hair will all turn grey. And due to your belief that you’re correct in your assumption, quite soon you actually will tune into and experience the reality of having grey hair. Again, please realize that a) ageing causes grey hair and b) I've started turning grey and c) this will surely continue, are all beliefs but they have nothing to do with the mechanics of what is actually taking place. By your belief in a future reality that you have grey hair you are selecting a parallel reality version of you who has grey hair. Realize that there's also a "future" parallel reality in which you do not have grey hair. Until you reach the place of knowing beyond a shadow of a doubt that your personal universe is driven by your beliefs you will continue to buy into the mass consensus belief that getting old typically means having grey hair! However, the important thing to know about beliefs is that they are always self-perpetuating and self-reinforcing. That is to say whatever belief you have running it will always do everything it can to make it seem as if it’s the only belief possible for you, even though it isn't! Using the common cold idea as an example you may have noticed a lot of resistance to what I said especially if you’re a firm believer of science. And based upon your assumption and belief in the supremacy of science as the be all and end all it will be very easy for you to dismiss what’s being said as nonsense. However, I ask you: do you prefer catching a cold or knowing that it’s impossible to catch one unless you believe you can? Now I'll relate events that actually happened in my life to show you that your personal belief overrules anything that anyone else says is true. All beliefs are true and they all do their best to make it seem as they are the only truth but they are merely beliefs, they are not the ultimate truth! This event occurred in 2013. I noticed that I'd quite often made a few typos while typing on my PC. After wearing a friend's eye glasses I was aware of a whole new world concerning the clarity being displayed on my computer monitor. Thus I realized I needed eye glasses, so paid a visit to a recommended optician who confirmed this. I ordered high quality frames and expensive lenses used for computer work - you get what you pay for I figured. The deal included free service and cleaning of both the frames and lenses. After about one year of using the glasses the optician suggested, due to his training and beliefs, that I would need higher strength lenses by now. Rather than buy into his belief system I advised him that my eyes were fine using the current glasses I have. He didn't agree with me and wanted to test my eyes, but I refused. This not seeing eye to eye exchange continued for several years, but guess what - I'm still using the same glasses I bought back in 2013. That is to say while I do need glasses for reading, my eyesight has not deteriorated in 6 years. However, had I believed the optician I'd probably be on my 3rd or 4th set of glasses by now and my eyes would be worse than they actually are right now! This event occurred around five years ago. I'd noticed some numbness in my fingers and was inspired to visit a massage therapist. I highly recommend professional massage therapy - find out more on this self help skills page. However, on this occasion the massage therapy wasn't 100% successful. I'd heard that the high end private hospital has professional physio therapy, so decided to pay them a visit to check that out. Upon arrival at the physio center I was informed that the therapy would cost $40, so I agreed to take the treatment. Then I was informed that I must first see a doctor. Although I was dissatisfied abount seeing a doctor I agreed as I really wanted the physio therapy. After waiting about 20 minutes a nurse ushered me into a room labeled cardiology. I thought "here we go, not what I had in mind at all!" The doctor, let's call him Dr. House, spent about 30 minutes examining me and running multiple tests. Afterwards he advised me that he didn't know what my issue was, but proceeded to tell me about four nasty diseases (think House) and said my issue must be one of those, so he wanted to run more tests to confirm it. I politely said I'd think about it and asked if I can have the physio therapy now. To continue, the physio doctor asked me to do several exercises and basically wasted another 20 minutes. Finally, I had the physio therapy which consisted of only 10 minutes of hands on work, covering me in that cold ultra sound goo, applying an oscillating pulse and wrapping me in a towel in a freezing air-conditioned room for 30 minutes. This was a complete waste of time and a very uncomfortable experience. To top it off, due to the doctor's fees, even though I'd been quoted $40 in the end I had to pay $110. As I distrust Western doctors and hospitals, except for accident and emergency, I contacted a macro biologist. He suggested that I might be low on vitamin C and suggested I take a natural form of it called Camu Camu. As he sounded very knowledgeable I decided to believe him and purchased the Camu Camu for about $40 and started ingesting a daily course of it. Within 3 or 4 days of doing so the numbness was gone and has not returned. This event occurred several years ago. I visited my dentist (Dr. Noi) for routine teeth cleaning and while she was prodding around inside my mouth I noticed some pain in my upper jaw area. As Noi could not find anything wrong with my teeth she decided to take an x-ray. Upon examining the x-ray Noi showed me a discolored area above my upper gum and said it's a mouth ulcer and you will need dental surgery to treat it. I politely said I'd prefer to wait a while to see how it develops. Noi said OK but please return within 2 months for the surgery to avoid infection. As I hate having any kind of dental work done I was inspired to do some research on this issue. Upon checking online I came across an alternative health website that stated that colloidal silver can help with this issue. Perfect I thought, as I'd already been using colloidal silver for more than 10 years to treat cuts and burns as well as a number of other ailments. I always buy 6 or 12 x 500 ml bottles, so had some on hand. Following the advice of the website I started a regime of gargling and swallowing the colloidal silver about 3 times per day. I did this for about 2 months until I could no longer feel pain in my upper jaw. Then I returned to my dentist as promised. Dr. Noi took another x-ray and was shocked because the ulcer had completely disappeared. I explained to Noi about my colloidal silver regime, but I'm quite sure she didn't believe that's what caused me to heal. After reading through the events above you can see that when it comes to my health and well-being, rather than automatically and blindly believing that what others say is the best course of action, I always seek other opinions, including my own. This is your life experience and it's always up to you to decide and to choose which parallel reality reflection of reality you prefer to experience. If your beliefs dictate that Western doctors and medicine are the only way for you, then that's what you will choose and that's fine, I have no issue with it. However, from my perspective when it comes to my health and well-being, I choose to change my reality by looking into my beliefs and my thought process and in so doing focus upon another simultaneously co-existing parallel reality reflection of All That Is - and you are free to do the same! you to begin looking and thinking more deeply! Now, let’s look at the idea of someone who’s already created dis-ease within their body. Once you understand that there’s nothing "out there" you’ll stop playing the role of victim and deal with the cause. In order to shift into a parallel reality in which they don’t have the dis-ease they must first get to the root of why they created the dis-ease to begin with, and this can always be traced back to, yes you guessed it - holding on to some kind of negative belief. This advanced self help health page reminds you that if you do get sick it’s for a good reason, so don’t automatically become negative. Instead, realize that you are an extremely powerful sovereign being who creates your own reality ALL of the time. there are no accidents and no mistakes within creation, everything has a purpose! 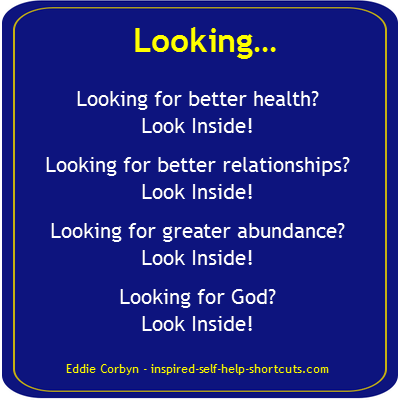 You Want Advanced Self Help Health? - You Better Believe It!